A healthy cookie that tastes good. I thought this would be impossible, but Dorie comes through again. I even had to stop my health-nut Dad from grabbing the cookie dough before it was even baked! He was excited to have something healthy to eat instead of all the chocolate desserts and pies I’ve been making lately. To make them a little more fun, I baked them in the bottom part of an ice cream cone and topped them with a dollop of ice cream and sprinkles. We were enjoying these outside on the front porch and the local squirrel must have smelled the peanuts and came within an arm’s reach hoping for his own cookie, I imagine! You can find the recipe for Granola Grabbers in the book Baking: From My Home to Yours by Dorie Greenspan or here. To see how the rest of the TWD group fared with this week's recipe, click here and then click on each blogger! Thanks to Michelle of Bad Girl Baking who chose the recipe for this week. Tips for baking these cookies in ice cream cones: Push the dough right to the bottom of the cone so that there’s a bit of cookie in each bite. Bake them an extra 5-8 minutes in the cones so that the middle gets done. These cookies were crunchy, chewy, and full of delicious surprises. 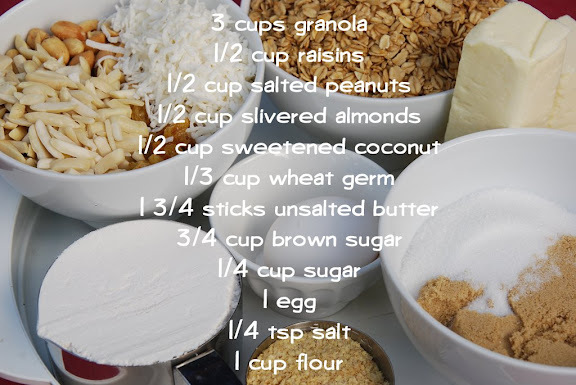 I loved the combination of salty peanuts, raisins, coconut, almonds and granola. It makes them seem almost good enough to eat for breakfast! My kids were wishing I’d added chocolate chips, so I may try that next time, but I liked them as is. Chocolate-Banded Ice Cream Torte on pages 288-289 chosen by Amy of Food, Family and Fun. leave it to you to come up with a great presentation! very cute!! Those are the cutest things ever! How creative! very creative idea! umm, theh cookie dough WAS quite delicious. :)can't blame your dad for sticking his fingers in it! I would never have thought of baking them in an ice cream cone! What an idea! And if you put a tiny scoop of ice cream on top, so it kind of melted down into the cookie.... oh my. So cute! What a clever idea! I loved these cookies. I'm with the kids. Chocolate chips were good. Oh, neat idea! I bet they were great, and I bet the squirrel would have liked them too. Ok, I officially hate you. Officially. They look so cute in the ice cream cones. Great idea! So stinkin' adorable! Who wouldn't eat anything from an ice cream cone right? Great job! Oh, Shari! These are just so delicate and adorable! I'll be making them for my sister, she'll love them! Holy smokes! These are so cute! So Cute! You are so creative! I'm glad you enjoyed them. too cute! I love the cookies in their little cones. What is on top? I have the same place mats. Cheers! What a cute idea. Something I wouldn't have thought of, that's for sure. They look wonderful. Brilliant presentation as always! Loooove the ice cream! those are too cute! i like the way yours looks like there's hand scooped ice cream in the cones! i made similar cones recently, but with cupcakes in them. i've been blown away by your creativity, you're really doing some amazing stuff. great job! Too cute! I really love your creativity! Stunning pictures, Shari. Sounds like you made a great cookie! I love the ice cream idea! Very cool! OMG, death by cuteness! What a fun, creative idea. Neat idea. They looked great. Simply adorable! You always think of the best-est things! ohh wow...those look SO cool! 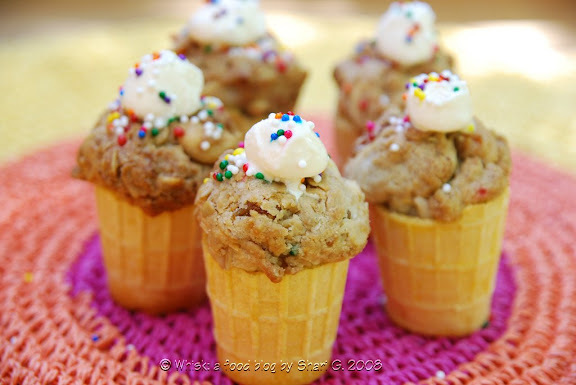 such a creative way to bake a cookie...ive never seen a cookie baked in an ice cream cone b4! What a gorgeous presentation! You are an artist! Fun way to enjoy these cookies! That squirrel obviously had excellent taste! Those are so cute, and I love the story about the squirrel! Those look so tasty !! These are cute! I am teaching Sunday school to preschoolers and I want to make it for them. They will love this special treat! I will let you know what they think! I tried the link and it's gone now. How long would I cook these for and at what temperature ? These look delicious, and very festive for parties. I am interested in decorating them a bit differently for the fall season. Can't wait to try!